We're building a YUGE wall around Trump's hateful politics at his convention in Cleveland on July 20th. This July, We're Going To Put 15,000 Feet of Wall Between Us and Trump. Fueled by fear and hate, ​Donald ​Trump is headed to The Republican National Convention in Cleveland on July 18th. And we are going to crash this Grand Ol' Party! Trump keeps threatening to build a wall to keep 'foreigners' out — criminalizing workers, marginalizing our ​families, and militarizing our ​communities. This wall is the emblem of his jingoistic prejudice and propaganda, and the rampant xenophobia driving his movement to Make America Hate Again. So ​as Trump accepts his party's nomination in Cleveland, we will be there to deliver our own wall. We — parents, workers, veterans, ​artists, ​students, and ​community organizers — will be at the edge of the perimeter to keep him and his ideas out of our communities with our own 15,000 foot banner wall. We are inviting you to decorate, paint, and graffiti a section of this wall to let Trump and the Republicans know that we are walling off his politics of racism, hate, and fear. Our wall is not just a line of defense against a Trump takeover. Our wall is also a line of offense in support of families and immigrant justice. Our wall stands for solidarity, safety, and militant love for our communities. What part of Trump's hateful agenda does your community want to wall off? How many feet of wall can your community take on and hold down? We're creating a 15,000 foot-long banner stenciled to look just like a wall. Then we're decorating and painting our wall to let Trump know that we are walling off his politics of racism, militarism, xenophobia, and fear. We're looking for communities, organizations, movements, and affinity groups to build their own section of the wall. 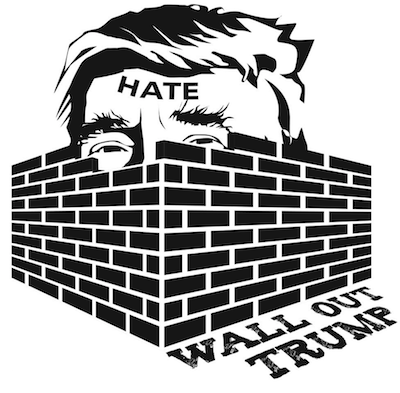 We'll provide the workspace, fabric, paint, and stencils so that your crew can be part of #WallOffTrump. Make a donation today and know that you helped make this moment possible. Copyright © 2016 MiJente All Rights Reserved.